Register to Attend – To Register please click here. All registration applications must be received by 11:59PM EST October 10, 2017. Applications received after October 10, 2017 will be reviewed on a rolling basis. Space is limited and priority will be given to applications submitted prior to the October 10th deadline. This form is to register for the Summit as an attendee, if you wish to participate in the ideas competition you should also register for the competition by visiting our competition tab. Interested youth are encouraged to find sponsors to pay for their transportation tickets and accommodation for the two days of the event. 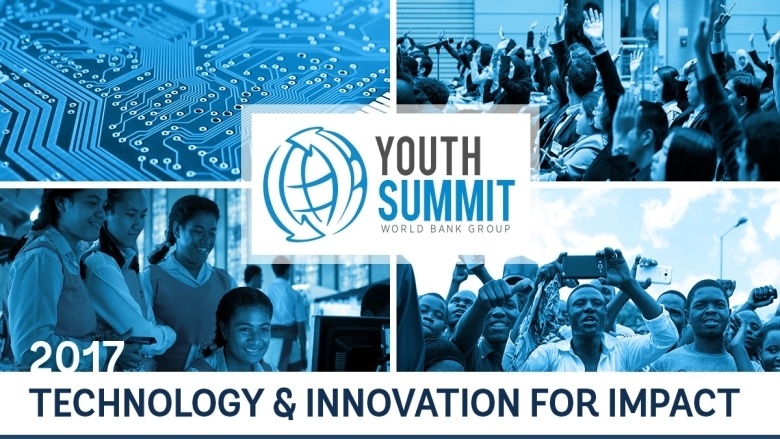 If attendance to Washington DC is not possible, please send an email to youthsummit@worldbank.org with “WBG Country Office” in the subject line and the Youth Summit Organizing Committee will make an effort to arrange a conference room in the WBG Country Office to watch the event live. If you can’t attend in Washington DC, we encourage you to join us online via World Bank Live. Further details on online viewing will be posted closer to the event date.